Start-up and ongoing operating costs are highly efficient when compared to fixed dental clinics. Treating patients in their comfort zone close to home, at work, school, retirement communities, business parks, parking lots of retail centers and more. Mobile units serve as a billboard on wheels, helping to promote the institution and a sense of security to the community. Patients receive accurate, efficient and friendly quality of treatment from trained and certified medical staff. Technologically advanced equipment providing most of the same services as fixed dental clinics. Mobile clinics can be equipped with wheelchair lifts and ramps, panoramic radiography and other imaging equipment. 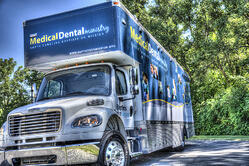 Mobile dentistry programs provide both preventive and restorative oral health services. Mobile dentistry programs mediate financial barriers, accessibility and psychological obstructions to the populations they serve. School-based dental screening programs linked to community dentists. School-based or school-linked dental sealant programs at selected grades to reach children for application on 1st and 2nd molars. School-based or school-linked dental preventive services, including porphyry, fluoride treatment, or sealants. School-based or school-linked basic restorative dental services. Many Federally Qualified Health Centers (FQHC), State Oral Health Programs, The Indian Health Service (IHS) Division of Oral Health (DOH) hospitals, non-profit groups and universities have implemented mobile dental services to increase their outreach to rural communities and schools. A university in California serves grades 2 through 5 at-area elementary schools. Their mobile dental unit provides critical dental care and oral health education to more than 13,000 underserved children yearly. The school’s mobile clinic has served more than 80,000 children and has been a required clinical rotation for all their university’s dental students since 1994. Another university that serves rural Appalachia operates a mobile dental clinic outfitted with three operatories in one unit for providing oral healthcare to children in public school systems and elderly patients at adult day care and long term care facilities. The organization’s revenues have continually increased, helping them to provide corresponding charitable care to the uninsured. They, along with others worldwide, meet the needs of distinct populations in specific locations. Their unique business and delivery model is adaptable to other NPOs by facilitating the needs of Medicaid patients and the privately insured, providing outstanding care to those who may not otherwise receive it. Mobile dental clinics are one of the only catalysis for dental professionals to broaden their patient base, while also reaching underserved and aging populations. Today’s more progressive dental practices and healthcare institutions are pursuing mobile dental delivery models. This is a vital trend considering that by 2050 the U.S. population over age 65 is expected to be 84 million. That’s twice of what it was in 2012. To amplify the need for more mobile clinics, many in this population segment will be non-ambulatory and unable to travel to a fixed facility for dental treatment. Today there are 48 million Americans that are 65 years or older. Many of whom are left to live with untreated chronic pain and infection that can lead to even more serious health issues. Not addressing this problem not only leaves millions of people to suffer, but is increasing the cost of our nation’s healthcare. By addressing this critical national health problem, dentists can not only help to alleviate the issue, but also broaden their business model and increase revenues. The dental community needs to focus on overall public health needs, fixing much of their attention on the aging population as well as children and those in low income brackets. Leveraging mobile clinics equipped with the latest technology is the fastest growing method to serve the underserved, increase market share and promote overall public health. It’s hard for us to imagine that only 200 years ago dental abscesses were a leading cause of death. There is and always will be a place for fixed dental clinics. Extensive oral surgery and other treatments cannot be performed in a mobile unit, which is all the more reason for mobile service providers to have affiliations with fixed clinics or hospitals in order to provide ongoing continuity of care to patients. 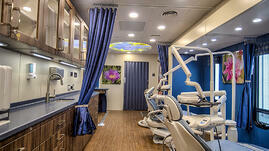 However, there is often a misconception that mobile dental clinics are too expensive to purchase and operate. In fact, building and operating a fixed clinic is shown to be much more expensive. And though traditionally a mobile clinic cannot see as many patients, its lower cost to entry and comparatively marginal operating costs make it a worthy investment on behalf of for-profit institutions and NPOs that need to reach vulnerable populations. 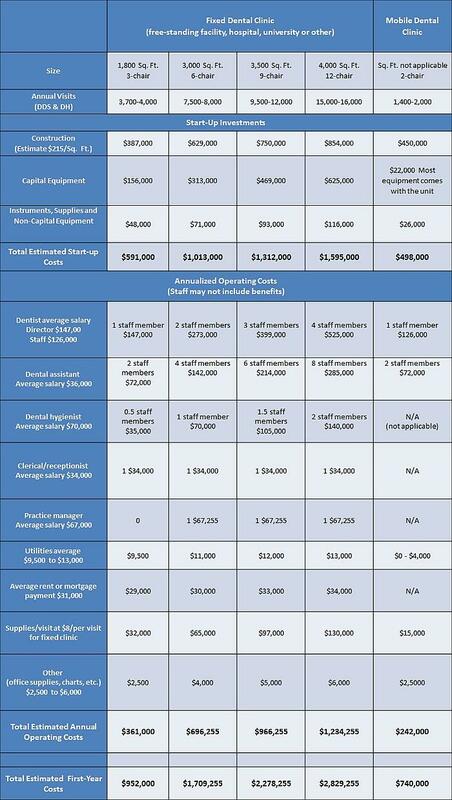 The chart below provides comparative estimates on the start-up and operating costs of each. The model of providing services in a fixed private dental practice will continue to work best for a large portion of the population. Yet the utility of that model is often variable or inadequate to meet the needs of other large portions of the population. Mobile dentistry programs help mediate structural and financial barriers to access of oral health services for many underserved people. Some point out relevant concern that mobile programs have the potential of acting in isolation from the historic and established dental care system of delivery. However it is clear that when mobile programs are properly integrated into established organizations within communities they can provide more positive healthcare outcomes for the community. Mobile dental services are highly effective in the integration of all-inclusive healthcare for the general population as a whole.